Rick Wallace (right) accepts the Debakey Award from Barbara Redman (left), President of the Friends of the National Library of Medicine, and Lucretia McClure (center), FNLM Board Committee Chair. For Rick Wallace, health science librarian and professor at Quillen College of Medicine, East Tennessee State University (ETSU), community outreach encompasses the entire state. He travels thousands of miles across Tennessee each year bringing vital health information to those in need, especially in rural communities. “I love getting out from behind a desk and traveling to rural communities where people need health information,” he says. 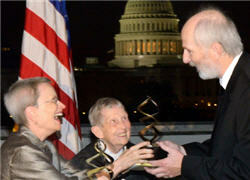 In recognition of his singular dedication to the rural underserved, the Friends of the National Library of Medicine named Wallace the recipient of the 2013 Michael E. DeBakey Library Sciences Outreach Award. The national honor is bestowed annually on a health sciences librarian for outstanding service to rural or underserved populations and is presented at the 2013 FNLM awards gala. “Being a health science librarian is a very personal thing,” says Wallace. “There’s a lot of technology out there now and it’s real easy to just sit in your office and tell people about the latest app. But for me it means getting out there and being involved in the community. Wallace began his calling in health sciences at the University of Tennessee, Memphis Health Sciences Library, working in circulation, in 1987, before finally finding his way to ETSU in 1995. Rick Wallace travels thousands of miles across Tennessee each year bringing vital health information to those in need, especially in rural communities. Wallace has spearheaded projects that have taken him back and forth across Tennessee. One such is “A Simple Plan,” which offers instruction in consumer health information for public librarians. For more than six years, Wallace and his assistants traveled thousands of miles annually training public librarians, distributing over 1500 articles over the last 17 years, and building relationships with some 40 rural hospitals and clinics, helping them obtain grants and pointing the way for rural public health departments to provide remote access to health information. Wallace and his group also have shaped consumer health information programs for Hispanic farm workers, high school students, elderly patients and staff in nursing homes, and cancer patients. 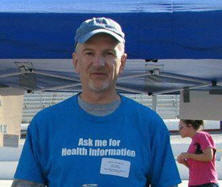 They have trained caregivers, religious leaders, and others to use health information tools. They’ve distributed smartphones, tablet computers—complete with clinical software—and other mobile devices to some 300 Tennessee clinicians. For example, working with the Migrant Health Program for Rural Medical Services, Inc. (RMS), in Parrottsville, TN, which operates one of five primary care clinics in the state and provides primary healthcare to migrant farm workers in East Tennessee, Wallace initiated and helped write a series of grant proposals that brought NN/LM funding for innovative health education programs. One grant brought community theater actors to the migrant camps to demonstrate good health practices for diabetes, perinatal care, and other topics. The grants also facilitated production of Spanish-language videos on prenatal care, and funded purchase of laptop computers and printers for Migrant Health Program educators, enabling them to access health information during home visits to the underserved. Wallace also led a team on several Remote Area Medical (RAM) expeditions to provide free medical, dental, and vision care and information to more than 2,500 of the working poor. November 1, 2013 in People.